Here’s what’s up in the world of TV for Sunday, May 8. All times are Eastern. 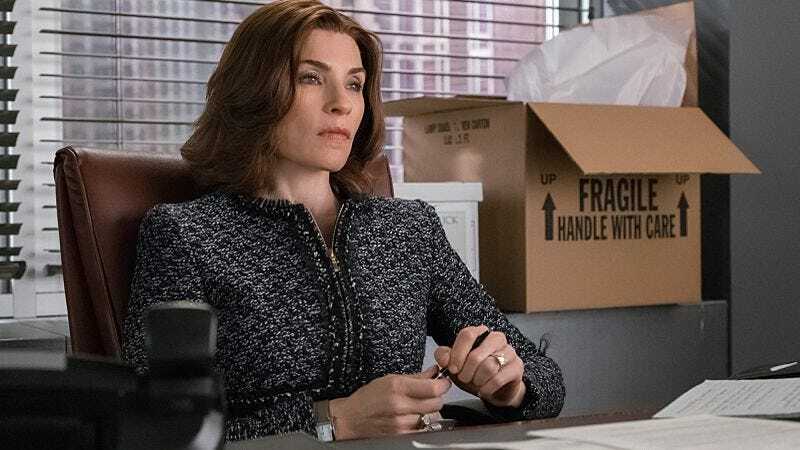 The Good Wife (CBS, 9 p.m.): What else is there to say about The Good Wife that we haven’t already said? It’s the rare network drama still able to go head-to-head with cable at the Emmys, the home of a tour de force performance by Julianna Margulies, a haven for character actors thanks to its never-ending cycle of eccentric judges and defense attorneys, a refreshingly post-queer show that dodged static sexual labels, a show whose interest in society and corruption made a claim for it being a worthy successor to The Wire, a legal procedural that defied conventions up to and including the use of “Previously on…”, and a complex and dark narrative that broke the genre with its penchant for plot twists before it ultimately broke itself with said penchant. Now, after seven seasons, five Emmys, endless plot twists, and the occasional shocking murder or absurd greenscreen debacle, the story of Alicia Florrick comes to an end. How will it all resolve? Could Peter be heading back to prison? Who will Alicia choose in the end: Peter, Jason, or no one? Might we see the return of the dead Will Gardner in ghost/vampire form or the even less likely return of the still-alive Kalinda Sharma? And just how far down the meta rabbit hole will Robert and Michelle King go in a season that’s increasingly skewed that way? However it ends, it’s sure to be a bittersweet experience for Kayla Kumari Upadhyaya, who stated last week it was once her favorite show on television and despite all her issues with this season she’s not ready to say goodbye. In lieu of flowers, please send all the red wine. The Simpsons (Fox, 8 p.m.): Once upon a time, The Simpsons sent Bart to France as part of a foreign exchange program that wound up being little more than child slavery. Now they return to the country as Homer takes Marge to Paris for her long-desired dream vacation, and all he has to do is transport a mysterious briefcase for a vague yet menacing government agency. Is he finally finding a way to bring Edil those civil defense plans he wanted so badly? Dennis Perkins just hopes Homer brings him some good wine, preferably not a vintage made with antifreeze. Penny Dreadful (Showtime, 10 p.m.): The premiere of this was so delightful that Penny Dreadful is likely to be a fixture in this section for the run of its third season. Tonight “evil forces track Vanessa’s every move.” Isn’t that to be expected? Vanessa is essentially the Kwisatz Haderach to all of the evil forces presented in Penny Dreadful, so keeping tabs on her is more important than any bloodletting or conquest. Scott Von Doviak will offer his tracking services to said powers of darkness in exchange for financial compensation and not being devoured. Madam Secretary (CBS, 8 p.m.): Speaking of powerful women dealing with adversity, in the second season finale of Madam Secretary Elizabeth McCord is facing the next challenge to her authority with the reveal that President Dalton—in between running for The A.V. Club’s office of pop culture president—may want to replace her as Secretary Of State. His top pick? Alicia Florrick. This probably isn’t happening, but given that CBS would almost certainly have pushed The Good Wife into a zombie eighth season if they thought they could get away with it, it’s not an implausible suggestion. Wallander (PBS, 9 p.m.): Kenneth Branagh has his boots back on the ground as the world-weariest of detectives returns for a fourth round of investigations, this time against the backdrop of a police conference in South Africa. He’s also experiencing some distressing dizzy spells and blackouts, during which he’s convinced he’s directing the actions of a Norse god or serving as the wizarding world’s preeminent storyteller. Elementary (CBS, 10 p.m.): Unsurprisingly, bringing Sherlock’s estranged father Morland to New York in season four hasn’t done anything to improve the legendarily frosty relationship between the two. (Also unsurprisingly, casting John Noble as Morland was an excellent decision.) Tonight, with the murder attempt on Morland still unsolved, Sherlock and Joan find themselves in the crosshairs of the assassin. Your What’s On Tonight correspondent is convinced the assassin is Clyde, who hasn’t forgiven Genevieve Valentine for retiring the Clyde Watch section and is now proving the importance of said section. Scrubs, “My Malpractical Decision” and “My Female Trouble” (Netflix): A dive into Julianna Margulies’ IMDB page reveals many interesting credits beyond The Good Wife and ER, including her starring role on Canterbury’s Law, a guest on The Larry Sanders Show, and a brief arc on The Sopranos as Christopher’s mistress. However, the first time your What’s On Tonight correspondent ever saw Margulies was as the charmingly ruthless malpractice attorney Neena Broderick on Scrubs, so that’s the lucky selection.